Expert pneumatic conveyor manufacturers typically combine off-the-shelf components, such as material receivers, to design custom or semi-custom systems that integrate seamlessly into a customer’s process. 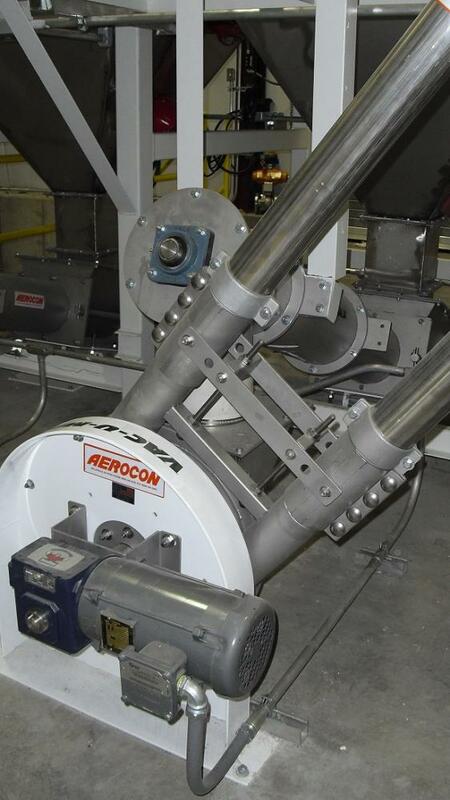 Aero mechanical conveyors, like this Aerocon system, are regularly used as an alternative to pneumatic conveying. Aero mechanical conveyors are ideal for applications where high-speed transfer of materials is necessary to equipment without suitable headroom to accommodate pneumatic receivers. Pneumatic conveying is the most hygienic conveying method for bulk dry powders and granular bulk materials because it is a fully enclosed system that protects materials from air, dirt and waste; and in turn, facilities from fugitive dust. Pneumatic conveying systems includes a programmable logic controller (PLC), or programmable relay, that handles complex information, dictating the sequence of events to occur, and can provide customers the ability to download data for evaluation. 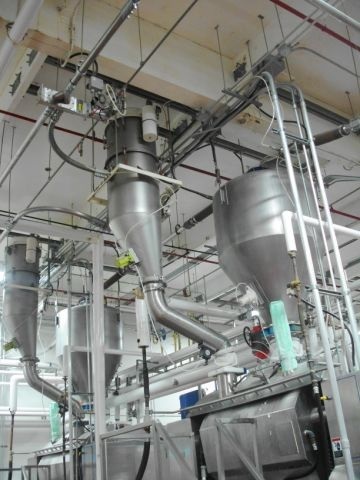 Pneumatic conveying is by far the most hygienic conveying method for bulk dry powders and granular bulk materials because it is a fully enclosed system that protects materials from air, dirt, and waste, and in turn, facilities from fugitive dust. There are, however, instances where mechanical conveying may be a better choice, such as when facilities have nominal head room above equipment, a need for high-speed transfer with minimal energy consumption, and transferring friable materials. The principal differentiator between mechanical and pneumatic is that mechanical conveying--including conveyor belts, slip stick, aero mechanical, flexible screw, and bucket elevators--use a mechanical device that is in direct contact with transferred material. 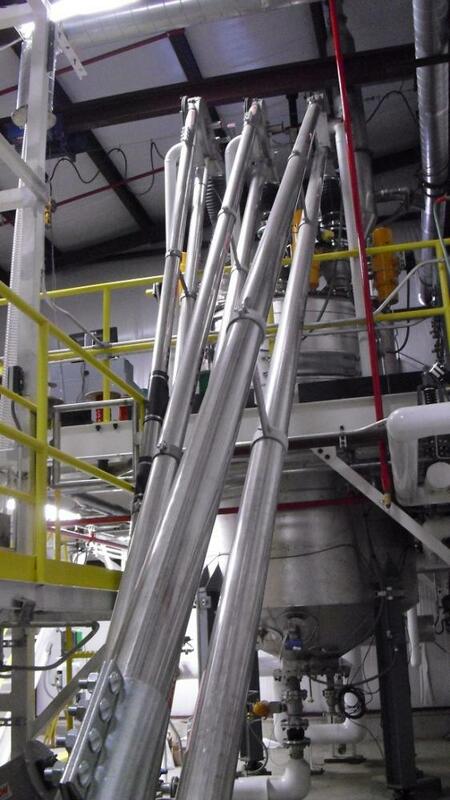 Pneumatic conveying uses gas (usually air) to transfer suspended material through tubes. Another distinctive characteristic between pneumatic and mechanical conveying is that pneumatic conveyors have virtually no moving parts, making cleaning and maintenance a breeze. Mechanical conveyors, with an array of moving parts, require more maintenance and more complicated cleaning procedures than pneumatic conveyors. Because every materials transfer system has unique characteristics and each organization aims to accomplish distinctive objectives, no standard equipment is suitable for all applications. Expert conveyor manufacturers typically combine off-the-shelf components to design custom or semi-custom systems that integrate seamlessly into a customer’s process. The advantage of a mechanical conveyor over pneumatic is the ability to move large amounts of material with minimal energy consumption. In mechanical systems, there is only a motor driving the system. A pneumatic system requires a motor and air to move the material. Due to the additional power components needed in a pneumatic conveying system, and the lack of a dust filtration system in mechanical conveyors, the dollar-to-dollar comparison makes the mechanical system less expensive to operate. Additionally, control panels on mechanical conveyors are about as simple as it gets, requiring minimal integration. Unless a company is working with a level controller or load cell, most of the time the control panel is just a fancy motor starter, reducing initial cost. In a pneumatic conveying system, the control panel includes a programmable logic controller (PLC), or programmable relay, that dictates the sequence of events that are to occur, can handle complex information, and provides customers the ability to download data for evaluation. Aero mechanical conveyors are regularly used as an alternative to pneumatic conveying using two parallel tubes with a sprocket on each end, and a drive motor on one end. Inside the tube is a cable with discs on it, often called a cable assembly. As the cable assembly moves, it displaces air and material, thus fluidizing the material, carrying it in suspension along the conveyer to the outlet using centrifugal force. Aero mechanical conveyors move material at approximately 20 cu ft/min with a 3-hp motor, contingent on material bulk density. Depending on the design of the conveyor, the cost of a mechanical conveyor can be one third of that for a pneumatic conveyor for the same output. In addition to aero mechanical conveyors, flexible screw conveyors, also known as shaftless augers, helixes, or spiral conveyors, contain many of the same benefits (such as speed) as aero mechanical conveyors. Flexible screw conveyors, however, utilize only one tube and instead of a cable assembly, they contain a metal spiral that rotates. The spirals look like a stretched slinky or spring, having the same diameter from end to end. Flexible screw conveyors move less material than aero mechanical conveyors, but they operate continuously, unlike the aero mechanical. A common use for aero mechanical systems is batch processing. A flexible screw is ideal for continuous, batch, or intermittent processing. Both can convey 2000 lb of material into a mixer in 10 minutes, but the flexible screw conveyor can operate continuously. Aeromechanical conveyors require a metered infeed and they must start-up and finish without material in the tubes. Flexible screws can be started and stopped with a headload of material at the feed end. Conveying with flexible screws is common in industry, leading some to look at the equipment as a commodity item. But that is far from true. Heavy-duty flexible screws are more rugged than the standard and last longer, meaning less maintenance and downtime, and therefore lower replacement expenditures. These rugged flexible screws generally come with two-year guarantees against twisting out, unraveling, or breaking. Where mechanical conveyors fall flat is the life of the equipment. Because mechanical conveyors contain more moving parts than pneumatic conveyors, maintenance costs are much higher and machinery is more susceptible to unscheduled downtime. More moving parts also means more difficult to clean, making them less desirable in sanitary conditions. High-purity applications that cannot accept any foreign contamination will not utilize flexible conveyors due to the plastic conveyor tube which can degrade over time. Aeromechanical conveyors utilize food-grade components, but have disc wear over extended periods of time. Regardless of the downfalls, sometimes mechanical conveyors are the only sensible cost-friendly solution. While pneumatic conveyors are a gentle method to move most materials, when there are legitimate concerns about material degradation, as is the case of moving a fragile cereal product. A bucket elevator is ideal for that, despite higher maintenance costs and parts replacement. Another example where mechanical conveyors are more suitable is when customers need to transfer 5000 lb/hr, but only have three feet of headroom above the equipment to which they are transferring. The options are to either put the vacuum receiver on the roof and build a structure around it and modify the building, or use a mechanical conveyor. When pneumatic systems make more sense to an operation, but ceiling height is a problem, integrating both pneumatic conveyors and mechanical conveyors is the solution. An example of this type of application is when a manufacturer wanted a pneumatic system to load a loss-in-weight feeder, but the feeder was in such a place that a vacuum receiver would not fit above it. The solution was to transfer the material from bulk bags to a vacuum receiver that then discharged materials into a rigid screw. The rigid screw conveyed it at a 45-degree angle up to the loss-in-weight feeder to replenish that feeder. The controls of the rigid screw integrate into the pneumatic conveying system and then the PLC interfaces with the loss-in-weight feeder, so when the loss-in-weight feeder indicates it needs more product, the pneumatic system kicks in to replenish the feeder. Situations like nominal head room above equipment, the need for high-speed transfer with minimal energy consumption, and transferring friable materials tend to be the most common advantages for mechanical conveyor use whether it is an aero mechanical, a flexible screw, a rigid screw, or bucket elevator. 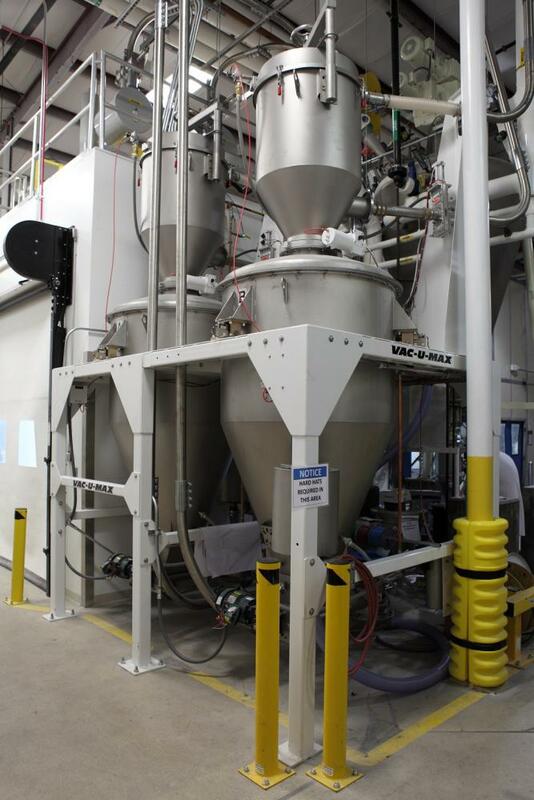 Working with a manufacturer with experience providing both mechanical and pneumatic conveying systems ensures customers get a conveying system that meets their needs and objectives. Manufacturers that perform testing with customers’ materials before equipment delivery can supply written guarantees that the conveying system will work as promised, and provide equipment warranties. Doan Pendleton is vice president, Vac-U-Max (Belleville, NJ). 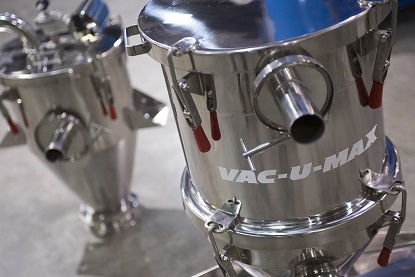 To learn more about how a conveying system--mechanical or pneumatic--can improve throughput, efficiency, and ergonomics, preserve product integrity, or reduce costs, cal1 973-759-4600, e-mail [email protected], or visit www.vac-u-max.com.